Home » Mercury~Power of Protection Sales Event! 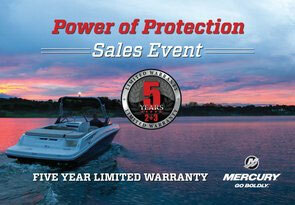 Mercury~Power of Protection Sales Event! Power of Protection Sales Event! NEW long-term protection from Mercury! Purchase a new Mercury MerCruiser gas or inboard engine (installed in 2016, 2017 or 2018 model year boats) and get five years of limited coverage!